And so we launch into the third month of Kitchen Parade's Veggie Venture! It remains an adventure, fun to explore new vegetables and new ways of cooking. I can't imagine stopping now! And the traffic energy has kicked up, thanks to recent mention in Kiplog and the Cheap Veggie Gourmet. While it's hardly 'summer' food, I gave in to a craving for cauliflower and cheese sauce tonight. My mom made it all the time when my sister and I were kids, cheese sauce on anything, always made with Velveeta. 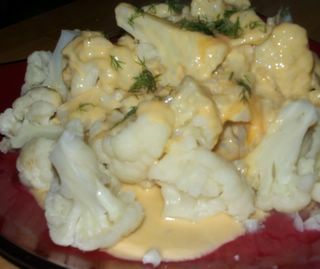 My contemporary addition is wasabi - skip this, however, for the simple comfort food, just cheese sauce on cauliflower. The cheese sauce took more minutes of attention than I'd have guessed. If you (or your kids!) like cheese sauce, however, double or triple the sauce, keep it in the frig for other vegetables on other nights. Fill a large saucepan or Dutch oven with 2 inches or so of water and bring to a boil over MEDIUM HIGH. Remove the cauliflower's outer leaves. Using a sharp knife, cut a cone shape into the tough stem to remove it. Cut cauliflower into individual florets, then cut these into bite-size pieces. Place in a steamer basket atop the boiling water. Reduce heat to MEDIUM and steam for 10 - 12 minutes or until a knife can be easily inserted into a thick stem area. If the cauliflower is cooked before the sauce is ready, remove from the heat and let rest, covered. While the cauliflower steams, heat the bacon fat in a medium saucepan over MEDIUM heat. Add the onion and cook until soft, stirring occasionally. Stir in the wasabi, then the flour and cook about 1 minute, stirring continuously. Slowly add the milk, stirring completely into the onion/flour mixture after each addition (see TIPS). Let milk heat up but don't let it boil or the sauce will curdle (see TIPS). Add the chunks of cheese and let melt completely, stirring occasionally. When the sauce is hot, taste and season (see TIPS). Immediately before serving, stir in the diced cheese (see TIPS). Pour 1/4 cup sauce over each serving. Garlic also works well in cheese sauce. The wasabi in my frig is a new product, a tube of paste. I know it's sold in powder form but don't know what to suggest substitution-wise since I've not used it. Two teaspoons seemed like a lot when first added, but once the sauce was served, it didn't seem like enough. If too much milk is added at first, there'll be no ridding the sauce of lumps. So start with a single tablespoon, work it in, then add another and work it in. Each time you work in another tablespoon, the flour/milk mixture will become increasingly liquid. Soon you'll be able to add more than a tablespoon at a time. Near the end, you can throw in whatever milk remains. If the sauce curdles, it's not a train wreck -- it will taste fine, just won't look as good. When seasoning the sauce, it pays to remember the cauliflower itself will not be salted. Melt all 4 ounces of cheese if you like but I like small 'bursts' of intense cheese flavor in the sauce. It seems to create a bigger cheese flavor with less cheese.